Clongowes Wood College, Clane, Co Kildare has announced that Tralee based PST Sport has been awarded the contract to resurface the all-weather pitch at the school. PST Sport is the leading Irish company in this specialist field with offices in Tralee, Dunshaughlin and London. The project will involve the upgrading of the pitch with the very latest surface in synthetic turf technology. The completed pitch will comply with World Rugby’s 2017 handbook for synthetic grass pitches. Work will begin on the project in late November and will be complete in January 2018. The current artificial surface in Clongowes is used widely by students at the all-boys boarding school, as well as local sports groups. The pitch, known as the VMP, is named after the late Vinnie Murray from Clane, Co Kildare – former Assistant Headmaster and Senior Cup Winning Rugby coach at the College and who passed away in 1999. The decision to engage PST Sport to bring the VMP surface up to the highest World Rugby standards constitutes a significant investment for the school, one which was made possible in part by the generosity of parents and friends of Clongowes. Once completed the facility will be available for use by the local community sporting groups and visiting teams from schools and clubs. The redevelopment of the VMP will come just weeks after the opening of the new 25m indoor swimming pool at the college. “We are extremely excited and honoured to have been awarded the contract to upgrade the VMP surface here at Clongowes Wood College. We’re looking forward to bringing our cutting-edge techniques in artificial grass installation to Clongowes and to playing our part in the development of future sports stars at such a prestigious school”. Clongowes Wood College SJ is a leading all boys boarding school in Clane, Co Kildare. Founded in 1814 by the Jesuits, the College has been at the forefront of Irish education for over 200 years. The school of 450 boys from Ireland and further afield provides an all-round boarding education with emphasis on academic development, a wide ranging co-curricular programme and the personal growth of its students in the Jesuit ethos. 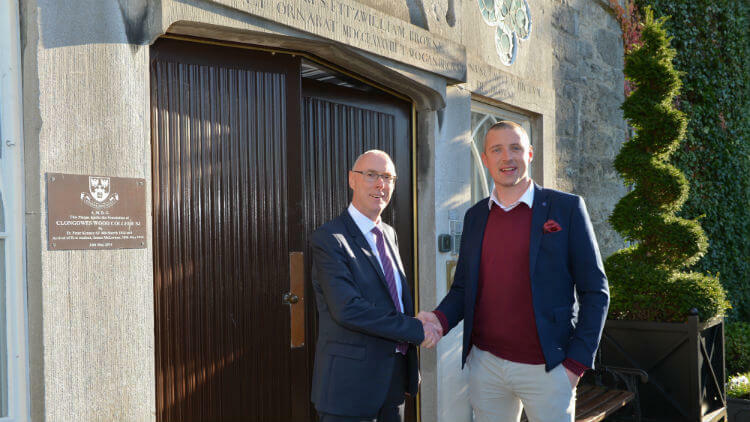 Photo: Clongowes Headmaster Mr Chris Lumb with Kieran Donaghy, Business Development Manager PST Sport.